Late last year, residents of Washington, D.C. got some good news as they shopped for health care insurance through the Affordable Care Act. The premium for the highly popular and lowest-cost “silver plan” for the 2016 season had dropped by four percent from the previous year. Health care insurance shoppers in Seattle received similar good news. The premium on the second-lowest cost silver plan for 2016 fell by 10 percent from the previous year’s level, providing consumers with a minor windfall. Six months later, as federal and state regulators and major insurers begin setting new premium levels for the coming year, millions of Americans including consumers in Seattle and the nation’s capital will be in for substantial sticker shock. Stretched by rising drug and health care costs and fast-changing market dynamics, the nation’s health care insurers have been warning since April about the likelihood of double-digit increases in premiums next year. State regulators are just now reviewing and approving new rates for the coming year. The enrollment season for 2017 is scheduled to begin Nov. 1. A new preliminary Kaiser Family Foundation analysis of Obamacare insurance markets in about a third of all major metropolitan areas projects that premiums on the most popular subsidized plans will rise by an average of 10 percent next year – or twice the rate of increase approved last fall. The analysis of insurance companies’ initial filings in 13 states and the District of Columbia highlights substantial variations in premium costs, depending on the region, demographics and competition among insurers. 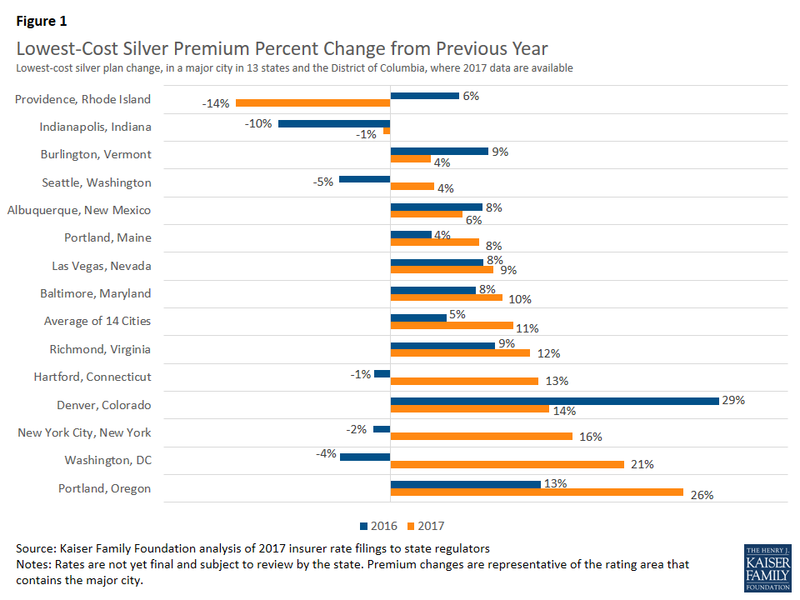 D.C. residents, for example, could incur a premium increase of 21 percent next year for the lowest-cost silver plan, according to the analysis, while the premiums in Seattle for the second least expensive silver plan could rise by 6 percent. Other metropolitan areas likely to see a substantial rise in premiums for the lowest-cost plan include Portland, Oregon, up 26 percent; New York City, up 16 percent; Denver, 14 percent and Hartford, Connecticut, 13 percent. Only Providence, R.I., and Indianapolis are likely to see declines in the monthly premiums for the lowest and second lowest cost plans. Premium costs of the two lowest-cost silver plans are highly significant because they are the most common plan choices in the marketplaces, with nearly 70 percent of Americans selecting one of them. Moreover, the second lowest-cost plan is used as a benchmark in calculating government premium subsidies. The study provides only a partial picture of the rising costs of another year of Obamacare. However, it strongly hints at a new problem for the Obama administration and the Democrats in defending the program during a tough campaign season, when presumptive GOP presidential nominee Donald Trump and other Republican leaders vow to repeal the program with an enrollment of roughly 12.7 million people. The program has been racked by previous hikes in premiums and out of pocket costs for patients, the collapse of roughly half of the 23 experimental, non-profit co-ops and the recent decision by several major insurers including giant UnitedHealthcare to pull out of Obamacare exchanges. Premiums nationwide for the popular silver-level plan surged 11 percent on average in 2015, but that didn’t account for rising deductibles or out of pocket costs that in some states jumped by as much as 76 percent. “While we cannot generalize to all states until more data become available later this year, in most of these population centers, the costs for the lowest and second-lowest silver plans are, in fact, increasing faster in 2017 than they have in previous years,” according to the Kaiser Foundation report. Department of Health and Human Services officials caution that states are still in the process of setting new premium rates for the coming year. Also, many low and middle-income consumers actually will pay considerably less than the sticker price for new coverage because they qualify for refundable tax credits that reduce the overall cost. For example, according to the new Kaiser study, the monthly low-cost silver premium for a 40-year-old non-smoker living in Colorado will rise from $223 in 2016 to $304 in 2017, a 14 percent increase. However, offsetting Obamacare tax credit for low-income people could negate much of that increase. A similar person residing in Baltimore will see his or her monthly low-cost silver premium rise from $243 to $267, or a 10-percent hike. But the enrollee would pay far less than that if he or she qualifies for a sliding-scale tax credit that is based on income. Moreover, consumers are encouraged by the government to shop around for the best bargain they can find on line in the insurance exchanges. Still, insurance industry representatives have warned that substantial rate increases are inevitable next year, as many companies are attempting to recoup their losses after grossly underestimating the costs of covering sicker people. Larry Levitt, a senior president of the Kaiser Family Foundation, told The Washington Post this week that insurers are treating 2017 as a “market correction year,” as companies struggle to position themselves to make more money from Obamacare in the long run. “The biggest things going on here are that insurers initially guessed wrong . . . and now insurers are playing catchup,” he told the newspaper.